Go Away Dark Night is finally coming together. All of the parts and pieces are there. I just need to finish sewing the parts and get the sashings cut and sew them all together. The sashing will be blue with green cornerstones. You can see one strip of the blue in the photo in the middle towards the top. I think I’ll leave these laying out on the floor a few days so Santa will get the hint that I really do need a design wall!! Very NICE. It’s going to be a beautiful classic quilt. I say make sure “Santa” has to walk through that room a few times a day until he gets the message that you need a design wall. It’s coming along beautifully! 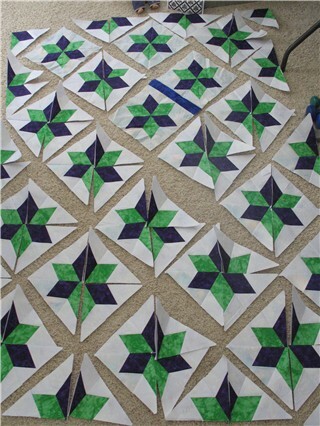 I agree with Sophie’s comment that it’s going to be a beautiful classic quilt. Those two cool colors look so nice together. Looking good! You better hurry if you are going to make your Dec deadline! Are you machine quilting it too?